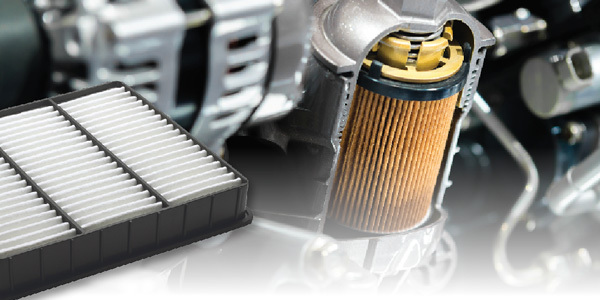 Have you ever wondered which is more important: an air filter or an oil filter? Both are obviously necessary to protect the engine from contaminants and abrasives that cause wear and damage. But actually the air filter has the most important job because it keeps contaminants from entering the engine in the first place. Particles that get past the air filter will be sucked into the cylinders, where they can abrade the rings and find their way into the crankcase and cause further damage. Outside air contains quite a bit of microscopic dust. A high-quality premium air filter will usually stop 99 percent to as much as 99.9 percent of particles between 5.5 and 176 microns in size. The smallest particles are less than one-tenth the diameter of a human hair, so we are talking really fine dust. Yet it’s often the smaller particles (5 to 20 microns) that cause the most damage. Dirt that gets past an air filter can foul airflow sensors, wear turbochargers and superchargers, clog throttle bodies and wear intake valves, piston rings and cylinders. And dirt that eventually ends up in the crankcase can damage engine bearings, camshafts, lifters and other valvetrain components. Some cheap-quality air filters are only about 93 percent efficient, while the “average” air filter is around 98 percent efficient. A filter that is only 93 percent efficient will allow more than 20 times as much dirt to pass through the filter than a filter that is 99.5 percent efficient. That’s why a good-quality air filter is so important for keeping contaminants out of the engine. By comparison, an oil filter traps debris that finds its way into the crankcase. The filter does nothing to protect the piston rings, cylinders or induction system. If the air filter is doing its job, the amount of outside dirt that finds its way inside should be minimal. The primary job of the oil filter should then be to trap microscopic wear particles from the engine’s mechanical components. Most of these are micron-sized particles that cause minimal wear. The main concern is debris in the 10- to 40-micron size range that can damage crankshaft bearings, turbo shaft bearings, hydraulic lifters or variable valve timing cam phasers. A standard oil filter with a pleated cellulose (paper) media will typically trap most particles down to about 25 to 30 microns in size, but allow most of the smaller particles to slip right through. A more efficient filter with a synthetic fiber media usually will trap many more particles in the 5- to 10-micron range to provide additional protection. When a cold engine is first started, the oil is thick and much harder to pump through the filter, so much of the oil bypasses the filter until the engine warms up. Many people don’t know that. Oil filters have an internal bypass valve that serves a dual purpose: It allows oil to flow around the filter media if the filter becomes clogged to prevent a catastrophic loss of oil pressure, and it allows cold oil to bypass the filter when the engine is first started so oil pressure can build quickly (which is especially important with overhead cam engines). The bypass valve opens when the pressure differential across the filter media exceeds 5 to 7 lbs. or higher depending on the calibration of the bypass valve. Oil filters have a limited service life, so if an oil change is delayed for too many miles, the filter may clog and bypass unfiltered oil to the engine. Some filters can run out of storage capacity in as little as 4,000 miles! Yet many oil-change intervals today range from 5,000 to 7,500 to 10,000 miles or more. That’s why it’s important to recommend a premium long-life oil filter with adequate storage capacity that can go the distance if a customer is following extended oil-change intervals.